Our Pastor, Fr. James McNerney, was born in Troy. 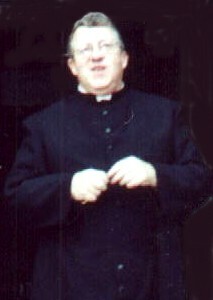 He was ordained a diocesan priest in 1981. He is a graduate of St. Augustine's Academy, and Catholic Central High School. He has a Bachelor's degree from Siena College, a Master's degree from Dartmouth College, and a Divinity degree from The Catholic University of America. He has studied abroad at Oxford and Cambridge Universities, and has a Doctorate in Ministry from the Graduate Theological Foundation. Father completed a three month program of Continuing Theological Studies at The North American College in Vatican City, Italy. Many of his articles have been published in journals and magazines. He was Chaplain to the Secular Order of Discalced Carmelites (OCDS) based in Schenectady, New York. He is also a Oblate of St. Benedict, and has a keen interest in monastic history and spirituality. He has been a teacher at the junior high, high school, and college levels. He was Chairman of the Philosophy and Theology Department of Crosier Seminary Junior College. He has two cats, Max and Smudge. He is the Pastor of three distinct parish communities: St. Paul's, St. Peter's and the "personal parish" for traditional Catholics. Bishop Howard Hubbard established this new parish for all those attached to the Traditional Latin Mass according to the 1962 Misssale Romanum as authorized by Pope John Paul II in Ecclesia Dei.